Li Gang once had high hopes for the revision of the Environmental Protection Law. 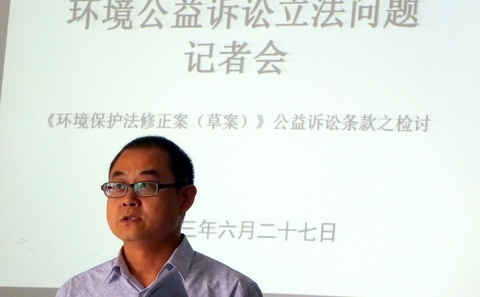 Li is a Beijing lawyer with many years of experience in public interest lawsuits; he hoped the new version of the law would provide legislative backing for public interest lawsuits on environmental matters. On June 25 these hopes were dashed. The draft revision, soon to be examined for the second time by the National Peoples’ Congress (NPC) standing committee, specified in a provision on environmental public interest lawsuits that only the All-China Environmental Federation (ACEF) and its provincial-level branches could bring such cases. ACEF is China’s largest quasi-official national environmental group. American environmental lawyer Philip Boxell pointed out the rule will significantly damage the development of environmental public interest lawsuits. What complicates the issue is that the draft revision has some positive features. The current Environmental Protection Law has been in force since 1989, with no real changes in more than two decades. But frequent environmental incidents over the last decade have shown the old law is unable to meet the need for effective environmental protection. The new revision includes language specifying that “environmental protection is a basic national policy”, and threatens daily fines for repeated polluters, with no upper limit. However, given the good progress in places such as Guizhou and Hainan on environmental rules and public interest lawsuits, many legal figures are struggling to understand the need for the right to litigate to be restricted to just one body. Public interest lawsuits have a fifteen-year history in China, with the first environmental public interest lawsuit being brought 5 years ago. In 2007 Guiyang set up an environmental court specifically to hear environmental cases, and the city also rewards those who report pollution. Kunming and Hainan have ruled on the bodies or groups which can bring environmental public interest lawsuits: in 2011 Hainan ruled that these were open to a wide range of agents, including the management bodies of legally-established nature reserves, groups engaged in environmental protection, neighbourhood and village committees and individual citizens. These existing practices go far beyond what would be permitted by the draft revision currently under consideration. Legal figures such as Xu Xin and Li Gang complain that it would be better to have left the law as it was. Opposition to the proposed legislation from Chinese NGOs has been even fiercer. Friends of Nature sent an open letter to the NPC on June 26 which described the rules as unscientific, lacking legal basis and hard to implement. In 2011 Friends of Nature successfully brought a case against those responsible for cadmium pollution in Yunnan, the first such action by civil society. The group also complained that specific rulings on the rights and duties of an actual person or body infringed on administrative and judicial powers and confused specific and abstract legal actions; that by giving special powers to one body (rather than one type of body or a body meeting certain conditions) the principle of equality before the law was being breached; and that placing the effectiveness of the law in the hands of a body which may cease to exist did not meet the need for stability of the law: if ACEF was to be abolished or to reform, the article would lose its meaning. Also, the “environmental federation” is not a strictly defined body, as some local bodies have similar roles but under different names. Another environmental group, Nature University, also published a joint open letter on June 27, calling for everyone to have the right to bring such lawsuits. By the evening of that day the letter had attracted 242 individual and 84 group signatures. In answer to these objections, the ACEF told the media that this had been carefully considered: ACEF has a specialised staff of lawyers and environmentalists, as well as the experience and ability to handle these lawsuits. But Li Gang, who was once a volunteer lawyer for ACEF and is familiar with its litigation department, said that the department does not actually have a large staff, with volunteer lawyers taking on much of the workload. In addition to the concerns about ACEF’s efficiency and ability, its status as a quasi-official body has led to questions about its independence. Legal figures including Li Gang and Xu Xin worry that ACEF will be unable to avoid government influence, meaning that cases which may damage local economies will be overlooked. It is also easy to imagine that ACEF, which is overseen by the Ministry of Environmental Protection, will not be able to fulfil its responsibilities when it comes to litigation against the government. Existing animal protection law is not enough to stop the farming of bears for their bile, used in traditional Chinese medicine.